Ancient, tightly packed clumps of stars found at the fringe of the Milky Way are a good bet in the search for extra terrestrial intelligence (Seti), research suggests. Because of their abundance of stars, these "globular clusters" were an early favourite in the Seti field. But recent efforts to scour the sky for planets orbiting alien stars have had little success within star clusters. Now, two astronomers say there is good reason to keep up the search. 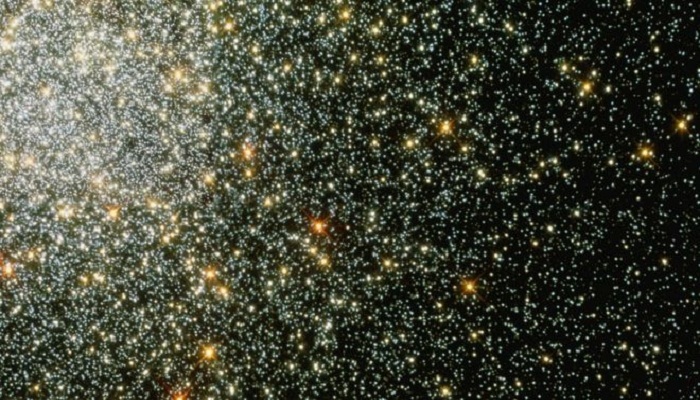 Rosanne Di Stefano from the Harvard-Smithsonian Center for Astrophysics, US, and Alak Ray from the Tata Institute of Fundamental Research in India, have described what they call the "globular cluster opportunity". At an average age of 10 billion years (much wrinklier than the Sun, at four billion), globular clusters don't have many young stars, rich in the metallic elements needed to build planets. But Dr Di Stefano, speaking in Florida at the 227th meeting of the American Astronomical Society, pointed out that recent discoveries had placed exoplanets - especially small, rocky ones like Earth - around stars much less metal-rich than our Sun. "When Seti first started in 50s and 60s, we didn't even know if there were exoplanets," she told reporters at the meeting. "Now we can use the information that we've gleaned from other planet discoveries - and there are over 2,000 planets known today - to ask, is it likely that they'd be in globular clusters." Dr Di Stefano also pointed to the remarkable example of PSR B1620-26 b, sometimes called "Methuselah". It is the only exoplanet so far detected orbiting a star - or in its case, two stars - within a globular cluster. "I think most of us would say that the discovery of that one, bizarre planet indicates that there must be other planets in that cluster," she said. Furthermore, Drs Di Stefano and Ray have identified a "sweet spot" in the dimensions of globular clusters. Because most of their stars are old, cool red dwarfs, any habitable planets would have to huddle in very close orbits to sustain liquid water. Staying wet, however, isn't the only challenge for a life-bearing planet in a crowded cluster. A ball of a million stars just 100 light years across is a raging turmoil of gravitational forces that can rip solar systems apart. But there is a region within these clusters, Dr Di Stefano said, where the stars are not so tightly packed that huddled, small, rocky planets would be stripped from their stars - and yet they are still close enough together that an alien civilisation might manage the leap from one to another. "In this large region... planetary systems can survive, and yet it's dense enough that it may facilitate interstellar travel." In fact, she added, these planets - if they do exist - could last even longer than the current age of the Universe, leaving ample time for intelligence and interstellar ambition to flourish. Other researchers at the conference agreed that these were interesting observations, even if the notion of ancient, star-hopping civilisations was - of course - a provocative speculation. "It holds together," said Jessie Christiansen from the Nasa Exoplanet Science Institute at Caltech. "It's very speculative, but I like the idea that because globular clusters are old, they've had more time." "Single-celled, simple life might develop quickly, but complex life - let alone intelligent life - seems to take a really long time," she added, citing Earth's natural history as an admittedly limited example. "So you might need those tens of billions of years." Alan Penny, an astronomer at the University of St Andrews in Scotland and co-ordinator of the UK Seti Research Network, told the BBC: "I think it does lift globular clusters up, in the wish list of targets to search." But they remain very difficult targets, he added. "They are still a very long way away. The nearest globular cluster is 400,000 light years away, whereas there are plenty of other, low-mass stars closer than that."